Seventy years after the Auschwitz concentration camp was liberated by the Soviet army, an SS guard known as the 'accountant of Auschwitz' is standing trial on 300,000 counts of accessory to murder. Oskar Groening, 93, says he expects an acquittal. 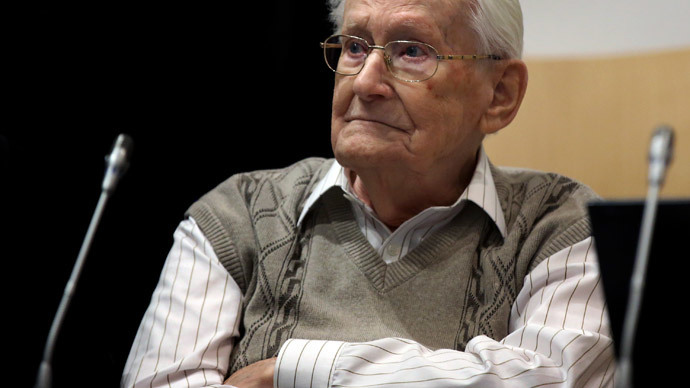 "In moral terms, my actions make me guilty," Groening told the courtroom in the northern town of Lueneburg, which was packed with almost 70 holocaust survivors and victims' families. Groening is facing charges related to a period between May and July 1944, when 137 trains carrying around 425,000 Jews arrived at the death camp from Hungary. At least 300,000 of those were sent directly to the death chambers, according to an 85-page indictment. Groening's attorney, Hans Holtermann, insists his client's actions in the camp did not make him an accessory to the murders. However, prosecutors argue that anyone who was a concentration camp guard can be charged as an accomplice to murders committed there – even without evidence of direct involvement in the deaths. "Through his job, the defendant supported the machinery of death," prosecutor Jens Lehmann said as he read out the indictment. During the Tuesday trial, Groening recalled an incident in 1942 in which he witnessed naked Jews being taken into a converted farm house near the camp. An officer shut the door, opened a can and poured its contents down a hatch. "The screams became louder and more desperate, but after a short time they became quieter again," Groening said. He added that this was the only time he observed gassing. He also spoke of his first day on the ramp where Jews exited the trains. He saw an SS guard grab a crying baby and slam its head against a truck until it was quiet. "I was so shaken. I don't find what he did good at all," Groening said, adding that he later went to his commander to request a transfer from Auschwitz. Dozens of holocaust survivors and victims' relatives traveled to join the prosecution as co-plaintiffs, as is allowed under German law. "The Holocaust was made of small men like him, little cogs in the machine. It wasn't just big fish, it was people like Oskar Groening. It doesn't matter what his punishment is, but the verdict. The Holocaust deniers can always say a little old Jewish woman told lies. But they will not be able to deny the words of a single SS man who admits he was there,” she added. “This may be our last chance to get information on Auschwitz from one of the perpetrators,” Kor, who lost her parents and two siblings in Auschwitz, told Bild daily. "To me this is not about a jail term for him, but about researching and dealing with the crime." The trial is seen as a last-ditch effort by authorities to put the small number of remaining Nazi concentration camp guards behind bars before they die. Of the 6,400 SS members who worked in the death camps, only 43 have ever faced prosecution. Of those, only 25 went to prison. The rest were acquitted. For decades, it seemed Groening would be among those never to appear in court. In 1985, the German justice system declined to pursue a case against Groening and other concentration camp workers, saying there was no causal link between their actions and the mass murders that took place at the camps. A subsequent request for trial was denied in 2013. However, prosecutors persevered, spurred by a 2011 precedent case in which a former SS guard was convicted of being an accessory to mass murder – despite there being no evidence of him committing a specific crime.